The ultimate success or otherwise of communication depends on how far it moves employee behavior. Here, Rodney Gray argues that unless we measure the impact on behavior – where the rubber hits the road – our efforts will fall short of true evaluation. Most corporate communicators understand the importance of measurement. But very few undertake true evaluation of the contribution their internal communication efforts make to the organization. And in my experience that’s just not good enough. Communication audits have been popular for many years. They can do a good job of measuring such things as employees’ perceptions of communication processes, content, sources, and media. That’s fine. But this falls short of true evaluation of effectiveness. I believe that what we should be measuring above all else is the impact internal communication has on employee behavior. This is where “the rubber hits the road”. The success or otherwise of our communication depends on how far it moves employee behavior in the direction we want. Communicators know that their effectiveness depends on the contribution their efforts make to the achievement of organizational objectives. And many align their communication objectives to the organization’s objectives. Despite this, most don’t know how to truly evaluate their success. The organization has to achieve stated objectives (vision, mission, goals) if it is to be judged as being successful by its stakeholders. Organizational performance, or what happens in the various parts of the organization, determines the extent to which the organization will achieve its overall objectives. Organizational performance depends on appropriate employee behavior. Employee behavior “contributes” to organizational performance. Employee communication attempts to move employees’ behavior in the appropriate direction. By assessing the organization’s objectives and what needs to happen for these to be achieved, we can decide what behavior is appropriate from various categories of employees. We can then make decisions about the best communication approaches. Managers have considerable influence over behavior through communicating policies, procedures, processes, systems and the like; and developing employees’ skills and competence. But some things cannot be influenced quite so easily. These include the beliefs and values which influence employees’ voluntary behavior and determine the organization’s culture. We can’t simply “roll-out” a new vision or set of values and expect to change the culture. Some communicators almost never measure the impact they have on behavior. By contrast, good trainers measure behavior before and after training. For example, they might get subordinates to rate their managers’ face-to-face communication skills and practices before training, and then again some months after the training. In this way they can tell if training has had any lasting impact. Some leading communicators are moving in this direction. The Body Shop measures the effectiveness of various communication approaches by using experimental and control branches. The branches in the experimental group receive the communication to be evaluated, while others act as a control group. The company measures employee behavior in both the experimental and control branches with “before and after” surveys to evaluate the effectiveness of the communication effort. This is just one example of how it can be done. Communicators can measure the impact of individual communication campaigns on behavior or performance. An important prerequisite is a “before’ measurement. And you can measure the overall change in employee behavior or performance over various time periods. Once you know which communication sources and media work for which types of content for your various target audiences, you can modify your communication approaches to suit. Resources can be diverted from communication methods that do not change behavior or contribute to desired organizational outcomes, to those that do. A good example of this comes from a recent project to turnaround a manufacturing company in the UK (the subject of a forthcoming article in TCM). The project consultant, change communication specialist Gerard Castles,2 is a great believer in ongoing measurement to assess communication effectiveness. 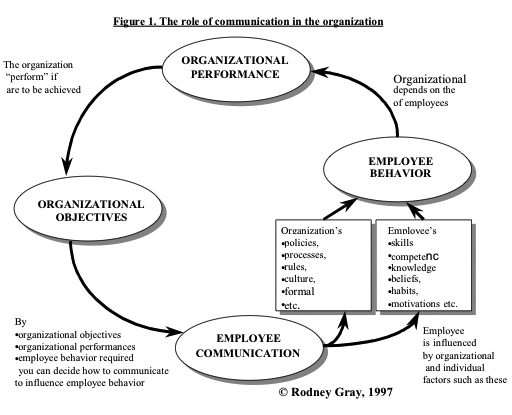 As usual, he measured the impact of various communication efforts on employee behavior. But no improvement was forth- coming. The communication approaches were not working. Then the comparative performance of the various shifts was communicated. This produced an immediate change in behavior in the desired direction and a dramatic improvement in the performance of each shift. As a result of this experience, Gerard recommends measuring (and communicating) organizational performance, not just behavior. Similarly, some organizations use such techniques as customer satisfaction surveys and mystery shopper surveys to measure (and communicate) changes in employee behavior and performance. Through measurements of associates’ attitudes to the job and company, retail giant Sears Roebuck & Co. is able to link those attitudes to behavior in terms of service levels provided, willingness to recommend products, loyalty, and turnover. Through causal modeling techniques, the company has also determined that over the last three years, there is a positive relationship between associate attitudes, customer satisfaction and revenues. This is a direct measure of communication’s impact on the bottom line. the communication skills and practices of senior executives and immediate managers. These help identify communication strengths and weaknesses in the eyes of our employees. Communication audits largely measure the extent to which employees’ communication needs and wants are met. This is necessary, but we should go further. To truly evaluate our achievements we need to measure how well communication contributes to what the management of the organization needs and wants. Only this can determine if the internal communication function really adds value. Communication audits generally only assess attitudes to communication: what’s working; what isn’t; and how employees think it can be improved. And again we can go further. Normally audits don’t measure such things as awareness, recall, knowledge, and understanding of, or attitudes to, specific business issues. It may be helpful to get this feedback. In quantitative surveys I sometimes ask multiple choice questions to find out what employees know (or recall) about various subjects. I always make clear that such questions are to assess the effectiveness of communication to employees. I don’t want respondents to feel that this is a test of them, or they might not complete the form. Since we are communicating continuously we should also be measuring continuously. There is no need to wait until an annual communication audit to find out how we’re going. Measurement does not have to be a big deal. Ongoing measurement exercises will help us plan and modify communication approaches. For example, my research often reveals a need for the CEO to explain to employees what is happening during times of major change. Employees often want the ‘big picture’ from the top of the organization. If, as a result, the CEO undertakes a roadshow I follow-up with a telephone survey of key opinion leaders in a range of locations to check the understanding and acceptance of change priorities. From this I can determine what the next communication steps should be. no way, I don’t believe a word of It; I still think you’re wrong. Do we need to change attitudes before behavior? Many communicators believe they need to change attitudes first in order to change behavior. Others say it is too “big brother’ to regulate behavior, and sincerely believe it is important to ‘win hearts and minds’ first. But the problem is that even if attitudes are changed, habits may be too strong and behavior may not change. Or if behavior does change, it may take a while to happen. So in many cases communicators are better off concentrating on attempting to directly change employees’ behavior. Some communicators almost never measure the impact they have on behavior. By contrast, good trainers measure behavior before and after training. This especially applies with regard to communicating to reduce accidents or improve service quality. We do have things to communicate which can make a fairly direct impact on behavior: rules and regulations; policies and practices; procedures and systems; rewards and incentives, for example. In some cases we have to measure behavior in order to be sure employees are capable of performing dangerous or demanding jobs. For instance, airline pilots are subject to strict rules that regulate their behavior, they have to practice their skills (by flying a minimum distance each year), and their competence is reassessed annually in a flight simulator. Flight attendants also have to pass a knowledge and evacuation test each year. Good service providers generally have a set of minimum behavioral standards, even if they allow considerable discretion as to how the service is actually performed (as Nordstrom does); and even if employees’ abilities are not regularly assessed as in the case of airline personnel. One aspect of psychology I remember from my university days is cognitive dissonance. Its significance is that we humans don’t like acting (behaving) in a manner inconsistent with our beliefs. Therefore, if we have to act a particular way on the job that is inconsistent with our beliefs, our beliefs will fall in line with our behavior or else we’ll change our job to avoid the dissonance. Not all employees will tolerate this approach, of course. Not far from my office are two Ritz-Carlton hotels, which provide an exceptionally high standard of service. New employees have been known to resign as soon as they are subjected to the strict behavioral standards enforced in the interests of maintaining high quality service. Excellent service providers such as McDonald’s and the Ritz- Carlton are continuously measuring employees’ behavior by way of customer satisfaction surveys, and they feed the results back to staff: “What gets measured gets done”. Another example is the introduction of widely available credit cards to Australia. This of course was some decades ago. The major banks collaborated to launch Bankcard (the local equivalent of Visa or MasterCard). Just before the release, market research of Australians’ attitudes discovered most were not in favor of “plastic money” and that Bankcard would be a flop. The banks decided that plans were too far advanced and decided to press on anyway. Nearly everyone in Australia was sent a card. Most people (like me) put the card in their purse or wallet just in case they ran out of cash. Gradually people tried out the cards, found they worked, and the rest is history. ~ behavior changed our attitudes and we quickly became enthusiastic credit card users. The market research of attitudes failed to predict our behavior. Measuring behavior is not new, of course. Social scientists have been doing this since the “Hawthome Studies” of the 1930s.4 But many organizational communicators have been slow to measure their impact on employee behavior. 2. Gerard Castles Communications, Hobart, Australia. Contact, gerardcastles@trump.net.au. 3. Shel Holtz, ABC, principal of Holtz Communication & Technology, Concord, CA. See www.holtz.com. 4. See Wayne R. Pace and Donald Faules Organizational Communication, Prentice-Hall, Englewood Cliffs, NJ, 1983, 1988.